Because getting ready to be a parent for the first (or second!) time keeps you busy enough, we have taken it upon ourselves to do the research for the best baby monitors out in the market. It would be difficult to find peace of mind as a parent if your baby was left in the nursery unsupervised. So when it comes to the well-being of you and your baby, having the best baby monitor can make the whole difference. After more than 45 hours of research, we think that The Infant Optics DXR-8 Video Monitor is the one you need to ensure the safety of your baby while you run about your home. After looking at over 100 models, we think this video monitor has the best combination of functionality, design, features and price. It also comes with the option to add multiple cameras, but it comes with one camera included if that’s enough for you. Now, let us walk you through from our top recommendations to our specialized ones. Giving you the ability to control the camera from your monitor – move side to side, tilt up and down, and zoom in for detail – the Infant Optics DXR-8 video monitor will give you the ability to perfectly check on your baby without having to step into the nursery. With its touch screen and larger screen, the Samsung SEW-3043W video monitor will give you all the perks of our top pick in a high definition screen. The higher price for this model makes it our step up pick, but not our first choice. Today, baby monitors are among the first things parents will add to their baby registry, but this wasn’t always the case. In fact, baby monitors were unheard of in the early 1930s and it took a nationwide scare to craft their invention. Check out this informative article on the origins of many baby basics, like our baby monitor. In 1932, the breaking news of the kidnapping of the Lindbergh baby deeply disturbed Zenith’s president, Eugene F. McDonald Jr., who worked for a then American company that manufactured consumer electronics. The kidnapping event caused McDonald to craft a radio system – with a monitor for the nursery and a receiver for the parent – that would allow him to hear into his daughter’s room. And thus, the baby monitor was born from this frenzy. But due to its original high market price, most parents could not afford it at first. It wasn’t until the 1980s, when wireless phones were beginning to be available, that baby monitors became commercially viable. Since then, baby monitors have boomed and become a staple in the nursery of our homes. Technology in the last decade has allowed the advancement of baby monitors, the best of which run on digital technology. This means they run on a secure 2.4GHz frequency, making them less prone to sound interference, a problem many older audio-only baby monitors experience by running on radio frequencies. These are the monitors we have highlighted as our favorite choices, as we consider them to be the most secure and reliable systems for your peace of mind. It is worth noting that some monitors can hook up to Wi-Fi, allowing parents to check on their baby at anytime and from anywhere using a smartphone or a tablet. The internet connection widens the convenience factor. However, monitors connected through Wi-Fi are more prone to security problems. So if you choose to use Wi-Fi to connect your baby monitors, make sure your security passwords are strong and the network is never open to the public. Baby monitors as apps are another point worth mentioning. Some startups have gone as far as creating baby monitors that run 100% through a smartphone application – leaving out the monitor and receiver parts that parents customarily purchase with baby monitors. You only purchase the monitoring system through the application, but you need to have at least one spare smartphone or tablet that you can leave in the nursery at all times. Wether you choose an audio-only or video monitor, choose a model with a 900MHz or 2.4GHz frequency. They are the most secure option, they will reduce interference risks and provide better sound quality. If a longer range connection is important, opt for models that can connect through Wi-Fi. This feature is practical for parents with larger homes or who would like to check-in while away from home. If you need reassurance that your monitor is fully working and your connection is strong, we recommend having a monitor with “low-battery” and “out of range” alert features. 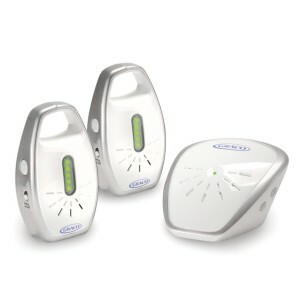 Consider finding a model that flashes or vibrates to alert you. Beeping alerts are often drowned around noisy tasks and can become highly irritating in silent environments. Our research was split into 3 different categories: the classic audio-only monitors, the more high-tech video monitors (commonly referred to as baby cams), and the ever-developing smartphone monitor apps. After taking into account all 3 categories, their functionality, their design features and their pricing, this was our verdict: we absolutely love and prefer video monitors. While audio-only monitors will accomplish the job, video monitors often include more high-tech options like: playing lullabies, canceling white noise, checking room temperature, and the obvious perk of looking into your baby’s nursery. While app based monitors provide the same visual advantage, we found them to lack most of the features we liked on the standard video monitors. Not to mention that a baby monitor app requires you to have a spare smartphone or tablet at hand. Our preferred baby monitors not only allow parents to look into the nursery without disturbing the baby, but they also allow parents to simultaneously use several of their features. They provide a secure network, they are sleek in presentation and their quality is backed by tried-and-true reviews from parents like you. A recognized leader in baby monitors, the Infant Optics DXR-8 continuously outperforms its competition. Its high quality products and its ability to make changes based on customer feedback has made it a #1 Best Seller on Amazon with 4.3 out of 5.0 stars and with over 3,500 customer reviews! The DXR-8 monitor is the first of its generation to have interchangeable lens technology. The monitor streams real-time video to the slim 3.5in LCD color display receiver, providing you with remarkable image quality. Its power is reliable, lasting 10 hours in power-saving mode and 6 hours with continued used. – The set-up is straightforward and fuss free. It comes with a secure 2.4GHz FHSS wireless transmission, giving you digital privacy without the video and audio lag. – This monitor has wireless portability with a power source that can last up to 10 hours in power-saving mode and 6 hours during continued use. – The camera rotation is smooth, making it a quiet and discreet option that will not disturb your baby. You can remotely control the pan and tilt of the camera from your monitor. – Th DXR-8 monitor comes with a spare USB charging cable that allows you to charge it anywhere around your home. You can plug it to your computer/laptop or any USB outlet that you have handy. – With sound activated LED lights, this monitor will alert you whenever your baby is making noise and you have the monitor’s volume turned down. The colored lights indicate 4 levels of noise from low (green) to high (red). – All monitors sold through Amazon include the newest software for the DXR-8, which includes the option to turn off “beeping” alerts, such as when the monitor becomes out-of-range and has low battery. – This model comes with a push-to-talk button, allowing the receiver and monitor to interact in two-way talk system. – The monitor will display the in-room temperature of the nursery, a reassuring factor for the comfort and safety of your baby. During the night when the lights are off, your monitor will also allow you to turn on the Infra Red (IR) night vision. – The DXR-8 is expandable up to 4 cameras, one of which comes in your kit. You will also find included in your kit a 2x zoom lens. And for the small cost of $11.99, you can purchase the system’s wide angle lens, which will give you a 170 degree panoramic view of your baby’s nursery. The Infant Optics DXR-8 baby monitor is #1 Amazon best seller in its category! It will not only satisfy you, but it will have you raving about it. With over 3,500 reviews on Amazon and many parenting sites talking about it, this monitor has gained a favorable opinion over its competition. Wether this is your first baby or you are having another, this monitor will excel at helping you keep a safe and healthy environment for your little one. We love its features. We love the sleek design. We think it the monitor is wholesome when it some to ensuring the safety of your baby. However, we do understand some parents might want more specialized monitors that allows them to play pre-recorded lullabies to and take photographs of their baby – which ten to be more high-end features of digital baby monitors. The Infant Optics DXR-8 lacks these features, which played into our decision for our next pick. The Samsung SEW-3043W BrightVIEW is a great step-up choice for its HD video quality, larger screen and two extra features: its pre-programmed lullabies and ability to capture photographs from the monitor. This monitor is another great product using the latest technology to give parents a peace of mind. Then high definition 5in touch screen is not only seamless in use, but it is also interactive as it allows you to look after the safety of your baby when you can’t be present in the nursery. – The Samsung SEW-3043W comes with a large 5in touch screen monitor, one of its best features against many of its competitors. The wider view that it provides will allow you as the parent to get a clearer view of the footage. This model is expandable up to 4 cameras, and with its large screen you will be able to get a crisp view of all cameras should you decide to expand. – Another great feature is its Voice Activated Mode (VOX) that alerts you of any noises that come from your baby’s nursery. This feature gives you the option to adjust the noise sensitivity level, a practical option to adjust depending on the time of the day. By turning on the VOX feature, your monitor will only turn on when it picks up noise from your baby – saving the equipment energy and allowing you to focus on tasks. 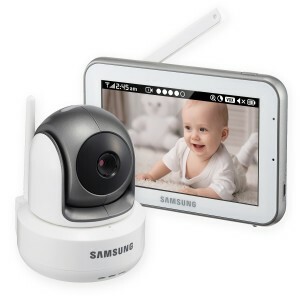 – The camera of the Samsung SEW-3043W is all inclusive and comes with a great range of movement. With a 300 degree pan, a 110 tilt and a powerful zoom, you can check in your baby with the simple use of arrows and icon options on your monitor. During the night, the non-visible IR LED night vision will allow you to look at your baby just as clearly. – A great extra feature of this model is its ability to take pictures of live footage from your monitor. Its 720 HD remote PTZ camera will allow you to capture spontaneous moments of your baby for a lifetime! – Another great perk of this model is its 4 pre-programmed lullabies. As a parent, you will be able to bring comfort to your baby even when you’re not in the same room. Play a lullaby or use the two-way talk system to sooth and reassure your baby. – Included in your kit is a USB charger that gives you the freedom to charge the monitor anywhere at anytime. Having a charging cable will come in handy as the monitor range can reach up to 900 ft. The Samsung SEW-3043W is an excellent step-up choice not only for its extra features, but also for its larger touch screen. If expanding your baby monitor system to more than one camera is a priority, then we specially recommend going for this model. Its intuitive touch screen will facilitate the management of all cameras and its larger screen will allow you to have a high definition look at all times. 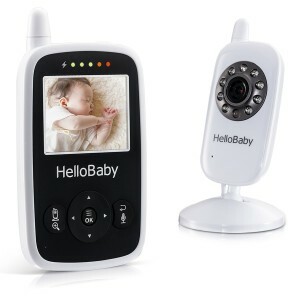 The Hello Baby HB24 video monitor is an exiting budget pick. We are aware that pricing can more often than not affect purchase decisions, but we don’t believe that quality or features should be sacrificed for a lower price! The Hello Baby comes with just as many features as our top and step-up picks. The monitor is small with a 2.4in screen, but its portability and minimal design make up for the loss in size. As for its features, they are all comprehensive to make sure parents can keep a peace of mind. – The HD image quality and LCD digital color screen will not disappoint you. What’s more, the real-time video in high definition will automatically change to night vision when the lights go off. – The audio of this model is run through a 2.4GHz FHSS system to prevent interference and connection loss. The monitor has a range up to 960 ft, which will give you the freedom to move around your home and yard freely. – Just like our step-up pick, the Hello Baby comes with a VOX mode. In this particular model, the VOX mode will turn off your monitor after 1 minute of silence from the receiver end. And should any noise arise, your monitor will automatically turn on alerting you. Your monitor will last for more than 12 hours in VOX mode, making it highly energy efficient. – With this monitor, you can comfort your baby with the 8 pre-programmed lullabies from and also use your soothing voice through its two-way talk system. Should you have the volume of the monitor down, the Sound Activated LED indicator will alert you if your baby needs to be comforted again. – While you work on other tasks around home, it can be easy to overlook the time. That is why this monitor includes an option to set up an alarm, a practical reminder for feeding and bath time. – Although this model was considered for its budget price, its camera capabilities are far from modest. With a 360 degree pan and a 120 degree tilt, you can be sure to keep an eye on your baby when you’re not able to be in the same room. Your cameras can also be expanded up to 4 with this system. The Hello Baby HB24 is a true steal for its price! Packed with the same features as our other two top picks, it is with pride we share with you our budget pick. Although smaller than the other two, it is easy to carry around and its minimal look makes it simple to use. And because we don’t think you should sacrifice quality for a lower price, we are happy to tell you this monitor is currently a #1 New Release on Amazon and ranking very high on its customer reviews. – Because budget pick has further inspired us to provide you with affordable video baby monitors that don’t break your wallet. 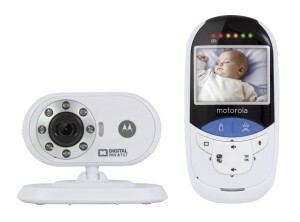 A trusted brand and leader in electronics, the Motorola MBP27T baby monitor is another steal for an affordable price. It features great quality in a compact device that is elegant. With its sleek 2.4in color LCD screen, this monitor communicates through a 2.4 GHz secure wireless connection. You can activate its IR nigh vision during the night and use its two-way communication to ensure the comfort of your baby at night. With a range up to 520 ft, you can complete tasks around home knowing the monitor will notify you when you are out of range or the receiver are running low on battery. When you find yourself around noisy tasks, the LED sound light indicator will still capture your attention visually, ensuring you never miss on any alerts. A last great and very unique feature to the Motorola MBP27T is its Touchless Thermometer! The monitor has touchless built-in temperature sensor that can measure from the physical temperature of your little one to the temperature of his milk. By the same company of our favorite pick, the Infant Optics DXR-5 baby monitor is a simpler and more affordable version than the Infant Optics DXR-8. This model provides your with a 2.4Hz FHSS wireless transmission for a secure connection. With a 2.4in TFT color screen and an automatic IR night vision, you can rest assures that you will always have eyes on your precious little one. When a visual on your baby is not needed, you can turn the VOX mode on, saving you on power. What’s more, this model also provides you with a an auto-mute mode, which cancels out static white noise that would otherwise be disturbing. With up to 800 ft in open ares and 150 ft in enclosed areas, the Infant Optics DXR-5 will provide you with unparalleled smooth video quality at an affordable price. 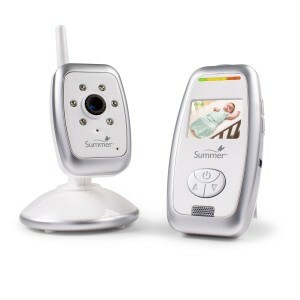 This video monitor might have the smallest screen out of all our proposed video monitors, but the Summer Infant baby monitors remains a high quality product with reliable features. 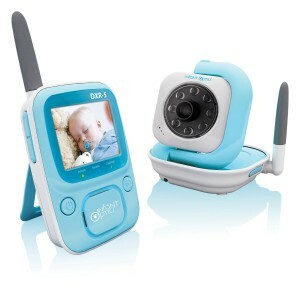 Its 1.8in LCD screen will provide you with a crisp image, while its 2.4GHz wireless digital technology will ensure that you and your baby are connected through a secure transmission. The portability of this model with its bult-in belt clip will give you the freedom to multi-task around home, all while making sure your little one is safe and comfortable. And don’t worry around tasks that prove to be noisy, because this monitor will alert you with its sound lights even if your volume is turned down. The Summer Infant baby monitor is flexible and designed to work around a busy home. As for those calm hours during the night, this monitors will automatically turn on its IR night vision and will allow you to talk to through the baby receiver should you need to bring comfort throughout the night. This kit comes with one camera included, but you can have up to 4 cameras to have maximum coverage around your home. – Because the essential is sometimes enough and although they might not provide you with video, they provide you with equal audio quality for a peace of mind. The VTech DM221 baby monitor uses DECT 6.0 digital technology to transmit crystal-clear sound that is without interference. DECT technology uses an encrypted signal so you and your baby can feel secure. With a range up to 1,000 ft, its lightweight design and its long lasting power for up to 18 hours, you can move freely around your home. 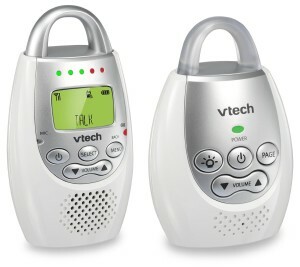 When your baby needs comfort and you’re not around, you can use your soothing voice through the talk intercom system. With its 5-level LED sound indicator lights, you can rest assured you will be aware of alerts even if you’re around noisy tasks. And with its original built-in night light, the baby receiver will soothe your baby during the dark horse of the night. 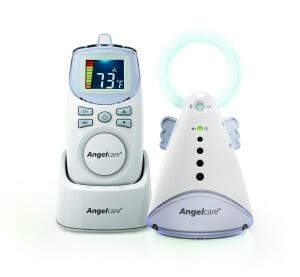 The Angelcare AC420 baby monitor provides you with crisp sound through its 927 MHz and 2.4 GHz transmission frequency bands. With a range up to 820 ft and a sound light indicator, you can move freely about your home knowing that you will be able to listen into your baby’s nursery. This monitor displays the temperature of the nursery, ensuring that your baby is comfortable even when you’re not around. Another feature is its nightlight on the baby receiver, a comforting halo of light that will sooth your baby all through the night. The Graco Secure baby monitor operates at a 900MHz frequency, which means you will not experience interference problems from other electronic devices, like cellphones or microwaves for example. This reliable secure system is also practical, as it comes with a belt clip for maximum portability. This model will allow you to roam freely around your home and even to the garden. With a 2,000ft range, you will be able to work around your home without worrying about your connection to your baby. And should you find yourself worried about running low on battery, the monitor will alert you. The Graco Secure baby monitor makes the equal share of tasks between new parents easier. Alongs with its long range and secure network will, the kit comes with 2 parent units! This will not only allows both parents to stay in tune with their baby from separate locations, but it will give you a constant assurance that your baby has all the attention it needs. – Because technology is constantly evolving around us, so what better way is there to keep an eye on your baby than from your smartphone? You always have it on hand! Based on our research, we decided to narrow down our selection to the best 3 applications out on the market. We also took into account the variety of smartphones that exist today and we made sure our selections would work for both Apple and Android devices. When it comes to features, all 3 applications are highly similar in the options they provide to ensure the safety of your baby and your peace of mind. All systems work over Wi-Fi, but allow you to use Edge, 3G, 4G and LTE services to continue monitoring your baby when you have to step outside your home. They also include press- to-talk and night-light options to soothe your little one during anytime of the day. Feel free to take a look at their websites to find out more details and purchase the applications. In today’s market, you will find a plethora of baby monitors to choose from, which can get quite overwhelming. From well-known electronic brand names to specialized ones, they will all stand by their product quality. this is why we have taken the burden out of your hands by performing over 45 hours of research on baby monitors. During our research period, we focused on quality and range so parents could gather a good feeling of what’s in the market. When we were finalizing our descriptions of our top picks and specialized ones, we made sure to break it down to different types that would be easy to digest. We also focused on comparisons, from pros to cons, to better help you choose what is best for you and your baby. From the moment we finalized our recommendations, we knew we had gathered a list of quality products that you were going to love. Our chosen baby monitors are well researched, have high ratings and have verified reviews from parents just like you. From video monitors, to audio ones and applications, we have presented you with a range of choices that is not overwhelming. Our selective choices ensure you and your baby will get a quality product no matter which monitors you choose to purchase. Parents go through much preparation before a new baby and they often get little sleep once the little one has arrived. We absolutely love the Infant Optics DXR-8 and recommend it as our first choice for your peace of mind. But no matter which baby monitor you end up choosing from our list, we are confident they will all inspire comfort through each step of your new baby’s life.